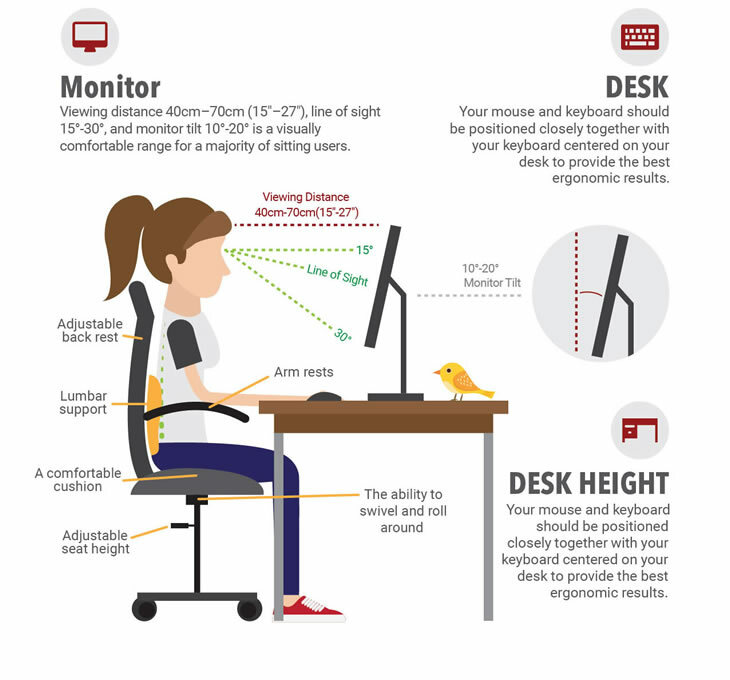 Ergonomics is the science of designing the work station to fit within the capabilities and limitations of the worker. Design your office work station to fit you and allow for a comfortable working environment for maximum productivity and efficiency. 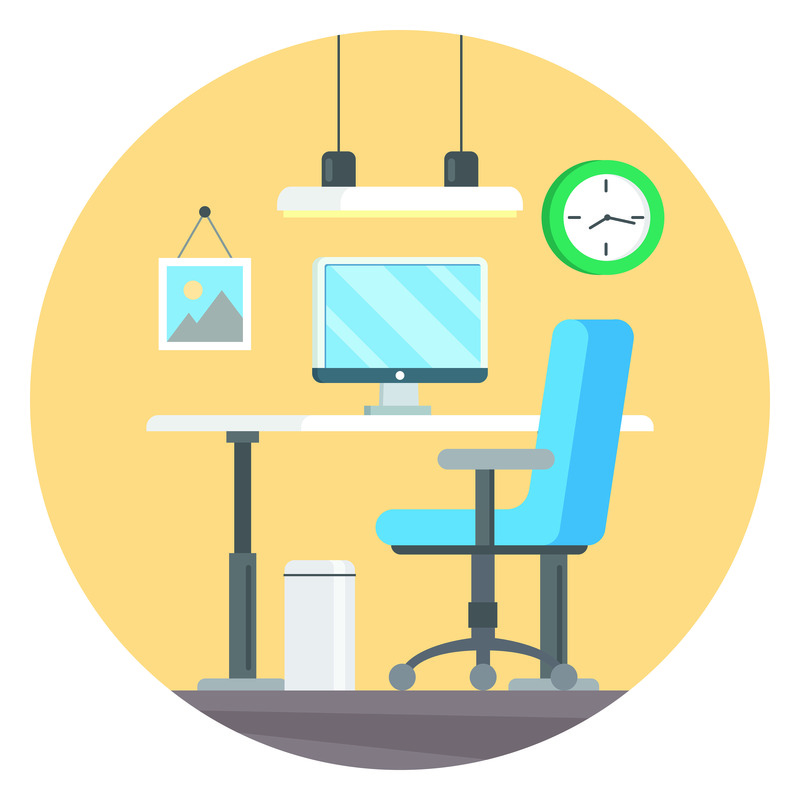 An ergonomically correct office work station will help you avoid fatigue and discomfort. According to the Washington State Office Ergonomic Research, the single largest class of injury claims in the office is Work-related Musculoskeletal Disorders (WMSD’s). WMSDs are soft-tissue injuries of the muscles, nerves, tendons, ligaments, joints, cartilage, blood vessels or spinal discs, and result from gradual exposure over a long period to low-level harmful agents called risk factors.The three primary ergonomic risk factors that cause WMSDs are awkward posture, high force or long frequency. Symptom of WMSD’s include pain in fingers, wrists, or other parts of the body; tingling or numbness, particularly in the hands or fingers; swelling, inflammation, or joint stiffness, and many more symptoms. What type of work will be done? What type of interactions are needed throughout the day? Ergonomically organize your keyboard, mouse, monitor, etc. Does it have arm rests? Is the back rest adjustable? Can it swivel and roll? Another way to combat the negative effects of extended periods of sitting is by utilizing an adjustable sit/stand desk. According to areport from the Society for Human Resource Management, standing desks are the fastest-growing employee benefit in US workplaces.Users of standing desks report reduced shoulder and back pain, less stress and fatigue, while improving mood and energy levels. Reducing sedentary time can improve physical, metabolic and even mental health. This is why sitting less and standing more is such an important lifestyle change. See all our available sit-to-stand desk options here and other ergonomic furniture and accessories here. Reach out to Rhyme today at 1-800-362-4333 to improve your workplace ergonomics.